Developed with IOS 5.1, iRocker for the iPad is a 3D application built using (at the time) state-of-the-art opengl-es 1.1 fixed-function pipeline and the PowerVR 2.0 SDK. 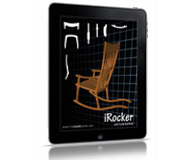 Description: iRocker is a groundbreaking app designed to augment the process of building your very own heirloom rocking chair. Complete with an enhanced virtual rocking chair that can be manipulated in 3D, including scale, rotation and view from any angle, it allows anyone to "test drive" this fantastic woodworking project before making a single cut. The user interface is as much fun as making sawdust! In addition, there is a section to organize your build notes, view/manipulate each part in 3D, order your tools and supplies and view included videos (some of them never before seen) showing the building process and helpful tips and tricks. You can even order the full sized templates and the complete DVD training series directly from within the app. Even if you're not a woodworker, you'll have a lot of fun playing with this cool interface.